What separates a Shepherd’s or Cottage pie from a Pot Pie is the crusted mashed potatoes on top. You can use leftover mashed potatoes or Tony’s Homemade Mashed Potatoes – smash them on top with a spoon – pipe them on fancily – or top them with grated cheese, it’s up to you. Other great potato variations include: Jalapeno, Cheddar, Dilled, Wasabi, Chevre, Pesto Buttermilk, Garlic or Truffle, or just make plain old Mashed Potatoes. We use a bottom crust on Tony’s Shepherd’s Pies (pictured), but that’s optional. You can make a crust with this recipe, buy a prepared crust, or leave it out altogether. Don’t feel like cooking? 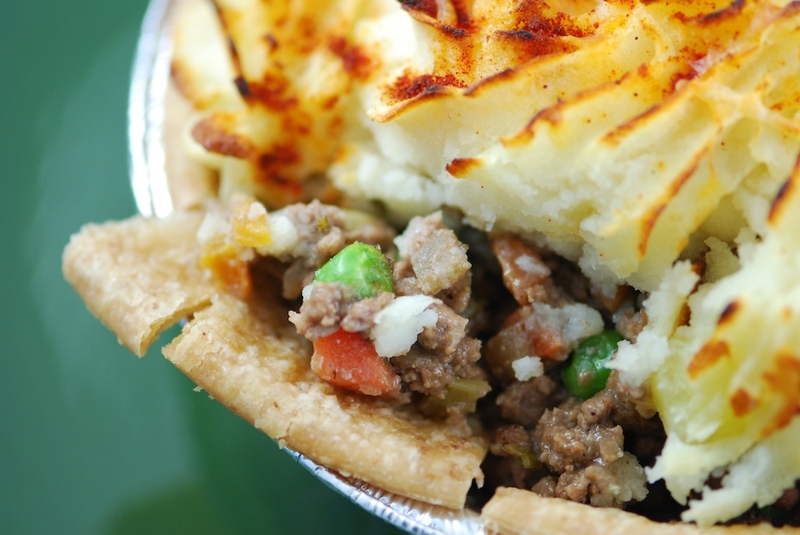 You can pick up homemade Pot Pies in our freezer, and our Deli Departments regularly make homemade Shepherd’s Pie – feel free to call ahead, if the chef’s didn’t make them today, they can make up a batch with a 1-2 day notice. Spoon into individual oven-safe ceramic dishes, or a large pie pan. Cover with warm mashed potatoes (spoon over; or warm, transfer to a pastry bag with a tip and pipe on decoratively), if desired, sprinkle with a nice English Cheddar Cheese (or blend cheese into the potatoes – optional). Roast on a lined pan in the top of a 350° oven until bubbling hot and browned (convection fan can be used to increase browning, as desired). Serves about 6. Chef’s Notes: *Steak sauce can be a bit bold for some, especially kids – add a little at a time, taste and adjust. The More Than Gourmet Red Wine Reduction sauce is brilliant! It’s like a delicious, thick wine gravy you just pour in – many folks would prefer the Wine Sauce with just a hint of steak sauce for flavor. Taste and adjust, it’s your supper! ** Chopped leftover veggies or a frozen vegetable medley can be used to simplify the recipe.